UPrinting offers printed tablecloths fitted for standard 6’ and 8’ tables. 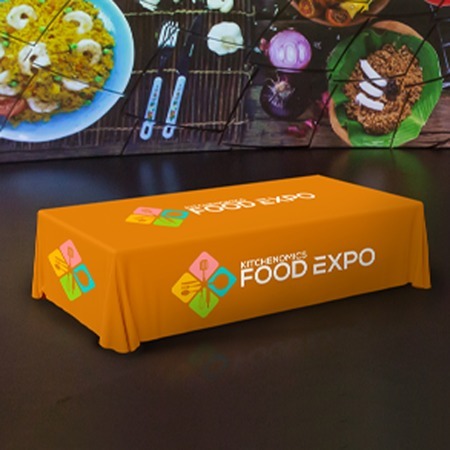 Custom tablecloths are printed in full color, and created with dye sublimation on a durable yet lightweight polyester fabric. These printed throws are easily portable since they can be folded and are fully machine washable, making them an incredible value. Use them over and over again in different venues. Tablecloths can be 3 or 4-sided, allowing them to be used in different contexts and orientations. Use the 3-sided tablecloths when access to the back and underside of the table is more important, for storage or more comfortable seating. Use 3-sided printed tablecloths for press conferences, book signings, trade show booths, and meet-and-greets. Use 4-sided tablecloths for product displays, exhibits and other situations where all four sides of the table are visible. Our printed tablecloths also come with hemmed edges and rounded corners, giving a finished look. This also helps it to drape properly and gives your brand a positive impression.